You can't go to Thanksgiving Dinner and not bring a gift! These are so easy, so quick, and so impressive! 1 sleeve of graham crackers or nine crackers. 2 cup(s) chocolate chips, melted, you may or may not have leftovers, it depends on how much chocolate you put in each cup. If it's not enough just melt more. 1. In a food processor, break up a sleeve of graham crackers. You want to pulse them for a good two minutes to make sure there are no big crumbs. Get it to a flour consistency. 2. In a large bowl, combine the graham crackers, melted butter, peanut butter, powdered sugar, and vanilla extract. 3. Line two cupcake tins with cupcake cups. Fill each cup with a heaping tablespoon of the peanut butter mixture. Then, gently shake and bang the tins on the kitchen counter to settle any bubbles and even them out. Chill in the freezer. 4. Make the caramel: In a small pot with tall sides add the sugar. Stand there and watch it for a couple minutes. Wait till the edges of the sugar start to melt. Swirl, don't stir the sugar. Let it go until it reaches an auburn color. Add the cubed butter. Stir. 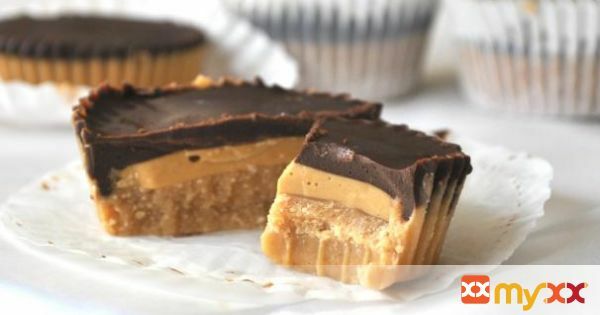 Spoon the liquid hot caramel over the peanut butter layer. 5. Over a double boiler, which is just a bowl put over a small pot with simmering water, gently melt the chocolate. When it's melted, cover the cups and shake the tins one finally time to smooth the tops and get rid of any air bubbles. It'll also give the chocolate a shiny professional appearance. 6. Store in the freezer or in the refrigerator. 7. And as always, Chow!